Removing Clutter – Removing Defects | DragonFire Inc. I found myself with two free days in Copenhagen, no family commitments and no work commitments, so I decided to make a personal commitment. I declared these two days a ‘writing retreat’ for myself. All I was going to do, was write because I am way behind on my blog posts and wanted to start on a couple of articles. The first thing I did on day one of my retreat, was go through notes that I captured and stored in my ‘blog ideas’ folder. I quickly came across an idea about addressing clutter… interesting, since I was now facing the task of removing clutter, and organizing my thoughts to write about. What’s so bad about clutter? Clutter impedes my thinking process – in this case, too many ideas that are not organized. 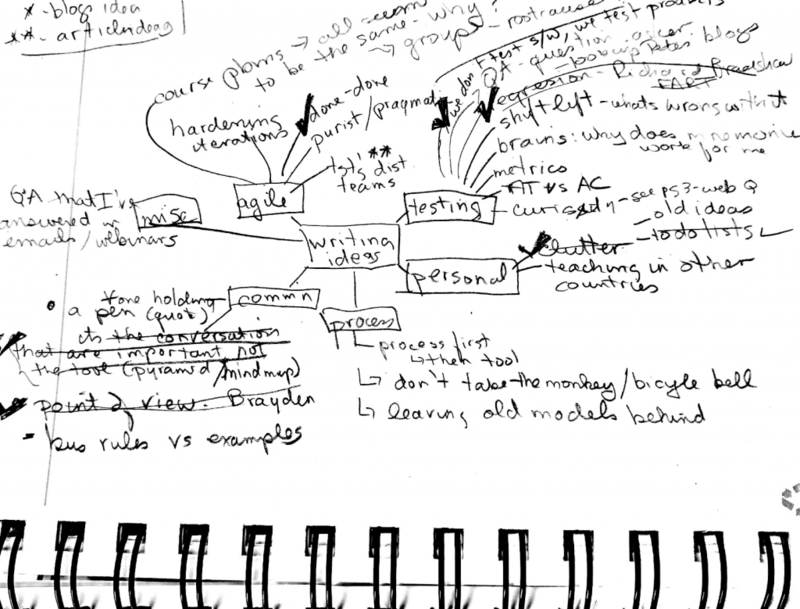 I reached for my ‘go to’ tool – mind mapping. I wanted to go outside in the quiet and warmth of this beautiful spring day so I took my notebook and started my mind map so I could carry it with me. I found myself in Kongen Have (King’s Garden) sitting amongst the daisies, watching people enjoying the day and listening to the sounds of children laughing, and smells of the tree blossoms. It was a great place to start removing some of my clutter. For myself, I find myself constantly reacting to the latest need or must do things. I try to fit those in between all the other stuff I have to do. I used to have to do lists, which made things worse because they get messy. I’ve learned to use personal Kanban boards – I’ve tried the on-line versions, but they don’t work for me, so I carry my slickynotes (slickynotes.net) everywhere I go. Because they attach via static cling, I can safely put them on any hotel room surface, and easily move them from place to place. I find that if I write down what I need to do, and place them in priority order, much of my mental clutter goes away. The squirrels slow down so that I can concentrate on what is important. Instead of clutter, it gains purpose. Clutter prevents us from moving forward. Can you do the same at work – with clutter like defect backlogs. In Lisa Crispin’s and my first book, Agile Testing, Antony Marcano tells us a story about defect backlogs being hidden backlogs. That is so very true, but I’ve come to also think of them as clutter … they get in our way every way we turn. Defect triages, should we fix it, how much information should we enter into the defect tracking systems … clutter that slows us down. I’m a fan of zero defect tolerance – that being, zero known story defects escaping the iteration. Instead of discussing a bug and giving it power, why don’t we just fix it. Remove the clutter by clearing it away immediately. Write an automated test for the bug, fix it and then forget about it. When teams have acceptance tests for small stories and have a shared understanding of the story, they know what is a defect and what isn’t. Only when a defect is huge – say, caused by a basic flaw in design logic and will cause an iteration to be jeopardized, should it be taken to the product owner to decide whether to fix it this iteration or the next. With no defect clutter, you help product quality, lessen technical debt, and allow the team to concentrate on more important tasks. When I was looking for ideas for my blog posts, I came across some very old to do lists that were not completed. What happened to those things that I never did? They fell off my radar. Maybe they were never really important and shouldn’t have been on the list in the first place. I am trying an experiment for myself to remove some of my own workplace clutter – my own hidden backlogs. I have saved my ideas that I thought important enough to make my mind map. I will date and prioritize those so I know when I had that idea and how important I though it is. I decided my work in progress (WIP) limit is 20, so when I reach 20, one will have to drop off the list or I will have to remove one by writing. To manage this backlog, I use an electronic version of my mind map, since I can’t carry my white board with me when I travel. Agree 100% Janet, if you don’t have the zero defect mentality, even if you remove all the clutter once and have a clean house, it will build back again. That is a great fable about Tim – thanks for sharing. You are right about building the clutter again, which is why I am experimenting with a way to prevent that from happening. I found that I have not reached my 20 limit – 2 left to go. I suspect I will have to be very stringent on watching my WIP limit. Defect clutter to the front line tester often is an impediment to product testing. Project Managers see defect clutter as an administrative headache. Hands-on testers see it as blocking them from getting their work done. Product bugs block testers from state cases. They obfuscate results making it difficult to determine correctness. Equally bad is “Test Case Clutter”. Product test cases mount up over a project’s life span. They become a problem when left unvalued so no one knows their merit. Testers waste important man-hours running the wrong tests. Project managers revel in test case success when they should not. All leads to a contest to run as many tests a possible, not to find as many valuable bugs as possible. Just as important as eliminating Defect Clutter, I believe it is important to eliminate Test Case Clutter. This is done by taking time to delineate test case importance to fulfilling customer requirements and finding bugs. Give a test case a value; sort test cases into value buckets; make sure when time is most valuable your team isn’t wasting time running tests of little value. A few days ago, a Paul Carvalho tweeted “Every software bug/defect logged, delays quality delivery”. I think that speaks directly to your first point. If we find a bug, let’s just fix it. Also, a good point about test case clutter. If a test is not adding value, why have it. That concept applies to both tests run manually as well as with automation.